Swank Audio Visuals sets the stage for a group in Florida.Swank Audio Visuals has been in the industry since 1937, back when P. Ray Swank began the company as a film distribution business. Now, 80 years later, Swank has become one of the most successful firms in the industry, with over 1400 employees and offices in almost every state. After several years in the film business, the company began to get involved in the equipment side of the industry, as Tim Brady, Swank's executive VP and COO, explained. "Swank's founders got involved in the equipment side of the business in the 1950's and were really pioneers in the house hotel services division throughout the years. In the 70's they really started to expand into the in-house services and go national. It began in St. Louis, MO, and expanded throughout the Midwest nationally during the 70's, 80's, and 90's as in-house service in hotels became more prevalent." As the years passed, technology became more complex and Swank grew. Brady said, "Technology is a big driver, and what it really drives is the way that people communicate, and that changes drastically with technology. It used be that in-house services were somewhat more simplistic, like the replacement of the overhead projector with today's data projectors. As audiences became more sophisticated naturally what they do in the meeting rooms has become more refined. It's evolved into what a lot of people refer to as Business Theater. That need to have a high impact in the meeting market has driven us to stay on the cutting edge of technology, and also to make sure our people are properly trained in that technology as well as that hospitality aspect that people who visit hotels demand." While Swank is well known for their in-house work, an emerging division within the company, the Event Services branch, has begun to see much more growth. Brady expanded, "We pride ourselves on being an in-house production resource, and our team performs at a level that you'd expect from a larger staging house. As a result of being successful on those shows, we've had a lot of clientele that have formed alliances with us. So the natural growth of that business is that we have more and more clients and production houses that ask us to travel and work with them on an end user basis. Recently we expended that and opened other offices in several cities. They're mostly focused in Phoenix, Orlando, Chicago, and a recently opened office in Las Vegas." Theme lighting creates the ideal mood for a Swank client in California. While both markets differ in how they're approached initially, Brady finds that they're very similar. "What's really different between those markets, is in the way the customer purchases the services required. 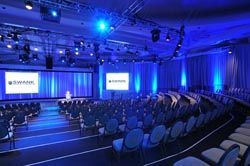 We've always been a company that's been focused on what the customer wants, and there's a lot of them that desire to purchase their AV and draw the creativity for their events with the hotel when they visit. But there's a large group of clients that would prefer to partner with an AV company. In that case a lot of them are buying their AV needs separately from the process of choosing their meeting venue. We try to provide services to either group, whether in house or with the event services team. We want the event to look and feel the same either way. "Swank treats their inventory a bit differently when purchasing new gear, as Brady recalled. "What we do with purchasing that's a bit different, is we empower our team members to drive that process because they're the ones talking to the clients. We have a purchasing and R&D division that's composed of people from the field, and they work together to drive that. In our business, there's always a bit of a trickle down. Whatever's happening on the cutting edge has to trickle down to the meeting market before people get comfortable with it. So we keep our eyes open and really empower our teams a lot." The Event Services team at Swank dazzled a client in Orlando, total attendance was 7,500. For such a large and sprawling company, training is mandatory to keep everyone on the same page. Swank has taken on exhaustive campaign to provide each employee with the latest information for the industry. Brady noted, "In the last few years, we've invested heavily into training. Part of our process is all fulltime new hires are brought to our training center in St. Louis within their first 30 days of employment to spend a week training. We have a training facility with a mock ballroom and AV showroom built. On the average all our team members attend over two weeks of training a year. What's unique for us is all our training is very employee driven. Our classes are written, composed, and delivered by our team members. I don't think anyone learns more than the teachers themselves." Brady places the success of Swank on this training initiative, "It's very beneficial to us and it's probably the lead advantage we have. AV is always so focused on equipment, but the reality is that it's really a people-driven business, because they are the ones that interface the technology to help deliver that message. And that's what's driven our growth, we can only grow as fast as having the right people provides, and that training system has really done wonders for us." Brady also places the company's success on a single outlook on the industry, "What's really interesting about the future, is the most successful companies in our business will be the ones that see the line between the event services companies and the in-house companies. The best companies will not only blur those lines, but significantly erase it and understand that the customer is looking for the same thing across the board."